Home / CBD Facts / How does your body absorb CBD? Your body will absorb CBD through your bloodstream. The most common reason people look to CBD is for relief from anxiety or pain. Some ingestion methods work faster than others. However, for CBD to have influence over our systems, this natural non-psychoactive compound first needs to be absorbed into the bloodstream where it can then be transported throughout the body to interact with our cannabinoid receptors CB1 and CB2, and non-cannabinoid receptors. CBD absorption depends on how it’s consumed. This can influence how effective the cannabinoid treatments will be. In general, there are four primary methods for CBD consumption. The one that works best for you may differ depending on your circumstances. Tinctures can be taken sublingually, added to food and drinks and rubbed directly on your skin, concentrates and vape oil are either used with a pin or smoked through a vape pen, edibles eaten and topicals applied directly to the sore spot. Liquid emulsions are a popular way to consume hemp-derived CBD because of the faster onset of action due to the product entering the bloodstream orally. Sublingual administration through the mouth is the most common way to take CBD oil. Taking CBD oil under your tongue and holding it there for 60 seconds sends the molecule directly into your bloodstream. When CBD oil is administered sublingually, it should be held under the tongue so that the mucus membranes in the mouth can absorb the oil’s active ingredients. With the correct dose, you’ll feel relief within 45 minutes to an hour, maybe sooner. The benefit of consuming CBD oil sublingually is that the absorption process bypasses the digestive system and liver metabolization, allowing the compounds to reach your bloodstream and interact with the endocannabinoid system more quickly. Sublingual CBD oil products like RESTART REPLENISH, RECOVER and RELAX are ideal for those looking for quick effects. RESTART CBD oil is flavorless with no aftertaste, so it can easily be held in the mouth to give the active ingredients time to be absorbed by the capillaries in the mouth before being swallowed. Another common way to take CBD oil is to ingest it orally. When you ingest CBD oil, it is absorbed through the digestive system and is metabolized by the liver, eventually sending its active compounds to your bloodstream. This form of administration is exactly how vitamins and other daily supplements are most typically taken. Common ingestible CBD oil products include edibles, capsules, and beverages. Capsules can be easily swished down with a mouthful of water and are among one of the easiest ways to take CBD. CBD oil can be infused into a wide variety of edibles and beverages, including coffee. Ingestion, while considered by most to be the easiest administration method, isn’t necessarily the most efficient for absorbing high levels of CBD unless you are consuming CBD with fatty acids that can help bypass the metabolism to increase how much CBD is absorbed through ingestion. Which is why RESTART CBD is mixed with organic MCT oil, a rich source of beneficial fatty acids. Some CBD oil products are designed to be applied directly onto the skin in the form of lotions and salves. These products are more applicable for potentially addressing pain or serious skin issues and are designed to be applied directly onto the skin. CBD is absorbed through the skin so that it can interact with cells that are near the surface without ever entering the bloodstream. 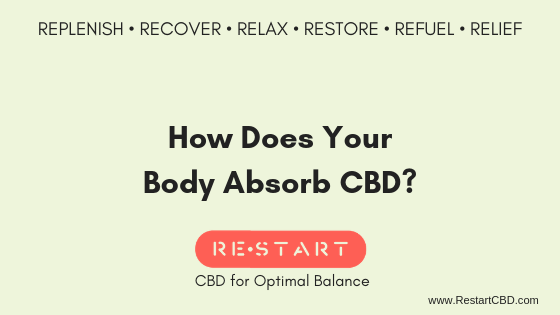 RESTART RELIEF CBD Salve is ideal for those looking for isolated pain relief or to address skin conditions because it can be applied directly to where you may need it the most. Human skin, in general, has low permeability, which means it blocks most substances from entering. The skin has a particularly low absorption rate for cannabinoids, however, when applied liberally, CBD is permeable to the skin through its pores. Some oils get absorbed quickly because they contain a lot of Polyunstaturated acids: Omega 3 (alpha-linolenic acid) and Omega 6 fatty acids (linoleic acid and gamma-linoleic acid). Oils that contain at least 50% of polyunsaturated acids get absorbed very fast. RESTART RELIEF CBD Salve and RESTART RELIEF CBD Roll-on oils are infused with organic grapeseed oil for its fast absorption. Natural grapeseed oil also contains Vitamin E to soothe and slow down the aging process, has nourishing properties and an anti-inflammatory effect. CBD can also be inhaled by vaporizing. Vaporizing CBD is typically a consumption option recommended for adults. The compounds are absorbed through the alveoli in the lungs, which offer a large absorptive surface area. A vaporizer heats CBD oil just enough to release its active compounds, avoiding the harmful byproducts that are created with combustion. During vaporization, CBD enters your lungs and diffuses directly into your bloodstream. Because it doesn’t have to make its way through the digestive system or liver, the CBD enters your circulation faster. Also, less CBD is lost during vaporizing compared to the ingestion method. The CBD molecules are immediately transferred into the bloodstream. Compared to ingestion, the inhalation method allows more CBD to be absorbed and offers faster absorption. CBD oil products designed for vaporization include CBD e-liquid, which contains CBD oil infused with vegetable glycerin (VG), MCT oil or combination of VG and Propylene Glycol (PG) plus high-CBD concentrate. Vaporizers range in size from tabletop, plug-in powered units to small, battery-powered portable pens. RESTART RECHARGE CBD Vape Oil is made with organic vegetable glycerin without the use of Propylene Glycol. NOTE REGARDING TERPENES. Some products use terpenes which are a natural solvent and are very harsh in really high doses. We honestly question if inhaling terps in large amounts like that is healthy as well. Now that you know how CBD is absorbed, you may decide that one method is more ideal than another depending on your needs. Select the method that you feel most comfortable with and you’re more likely to be consistent with your use.